What is old is new again! Upper Deck releases a full set of Ice for the first time since the 09/10 hockey season. Ice was popular to collectors because of the limited Ice Premier rookie cards. These acetate cards were great looking cards with some key rookies being extremely limited. Ice has had some of the most sought after rookie cards ever released! Could Upper Deck have been listening to me? I could have sworn that I said Ice cards should be all acetate... and now they are!!! The Ice base set contains all acetate base cards - and that makes the set feel like something very special. Unfortunately, new Upper Deck re-releases of older products have been of lower quality. Well, not here! Ice has upped the ante and made the base set something that is great looking and collectible. 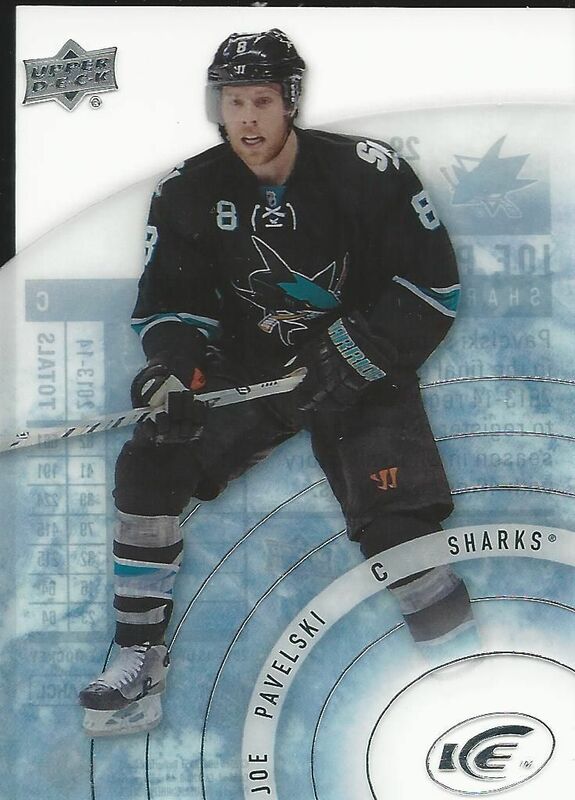 Each base card has a light blue hue or team colored hue if the player is a legend or goalie. The cards are sleek and modern, just as Ice should be. The back's of acetate cards are usually very difficult to work with. Because of the clear area that most acetate cards have, backs are limited in what they can contain. Upper Deck has done a brilliant job with the card backs in this release. Just look at at - there's a player write up as well as a creative way to show their stats. I'm impressed with how Upper Deck handled this back design. The Rookie Premier cards have been the draw of Ice over the years. This years Rookie Premier cards have a variety of different tiers and serial numbering. The only number most collectors will be looking for is 99 though. You've really hit the jackpot if you pull a Rookie Premier numbered to 99. Those are the top rookies of the year and generally have values in the hundreds of dollars. In terms of looks, these Rookie Premier cards are a bit lackluster to me this year. Collectors have been spoiled with some very unique looking Rookie Premier cards. Upper Deck has taken a slight step back with this year's look. Aside from finding the Rookie Premier cards, each 8-pack box of Ice will have a few hits to look forward to. Jersey, patch, and autographed cards can all be found in Ice. For fans of the old Upper Deck Black brand, you'll be happy to know there are cards with those designs put into boxes of Ice this year! 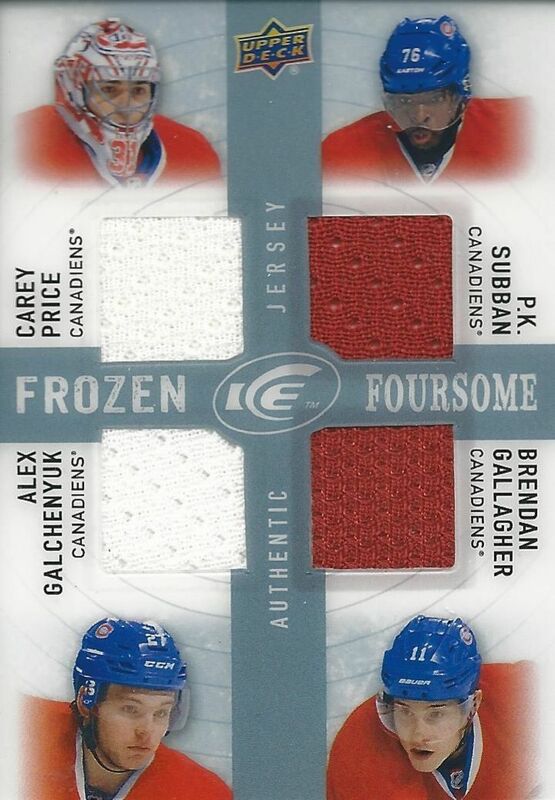 Here's a quad jersey card of the Montreal Canadiens. 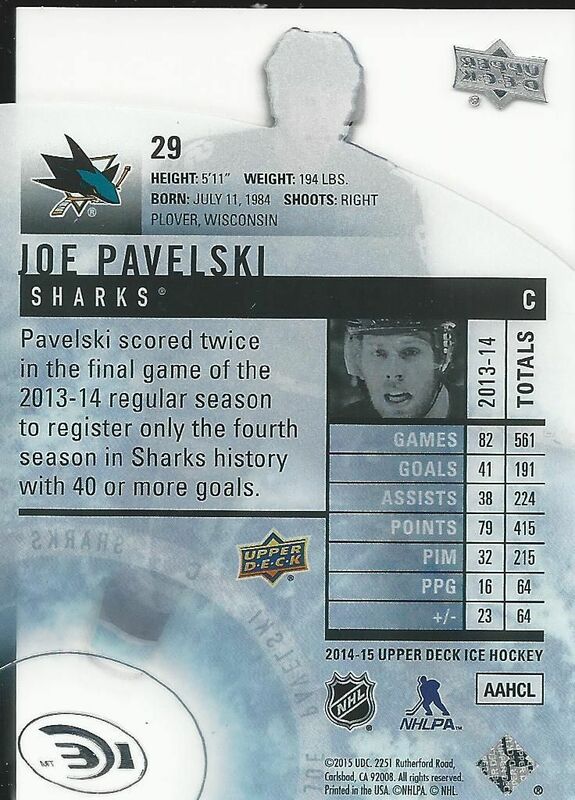 It's hard to tell in the scan, but just like the rest of the Ice cards this card is done with a glossy acetate sheen. I've got to say that the acetate works really well with the colors chosen for these inserts. It's great that these cards feature multiple swatches from multiple players, but the design odd. I keep thinking this card should be tipped over and seen horizontally. This auto/jersey of The Flower is clean, clean, clean. I love cards like this that just have all the design elements put together perfectly. The medium-sized jersey patch is actually under an acetate window. The signature is signed on card on the acetate portion. Often times signatures put on cloth tend to be messy. By having the acetate window on top, the card doesn't encounter that problem. It's a brilliant solution. 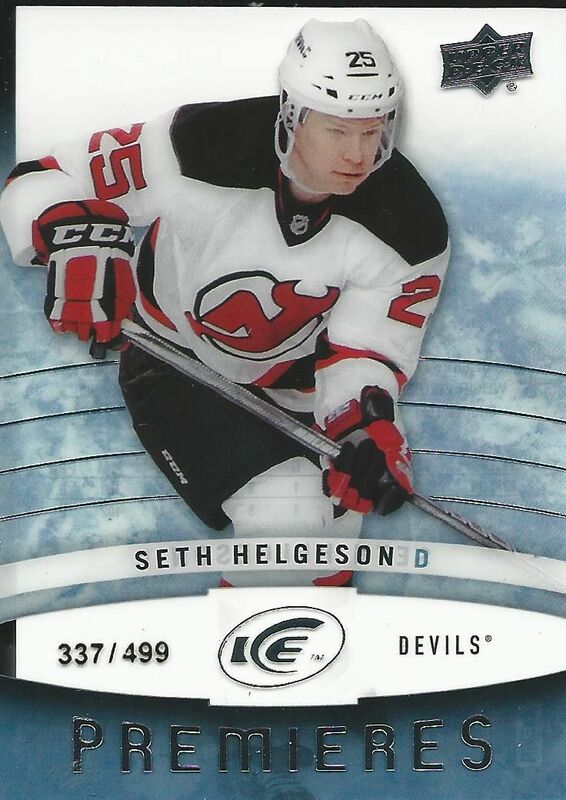 The Black insert cards in boxes of Ice will really stand out when you get them because of the huge color contrast they provide as compared to the Ice cards. Upper Deck Black was a super-high-end brand that was only released for a couple of years. I'm always glad when I can get my hands on some Black - it's so nice to have it back in hockey. 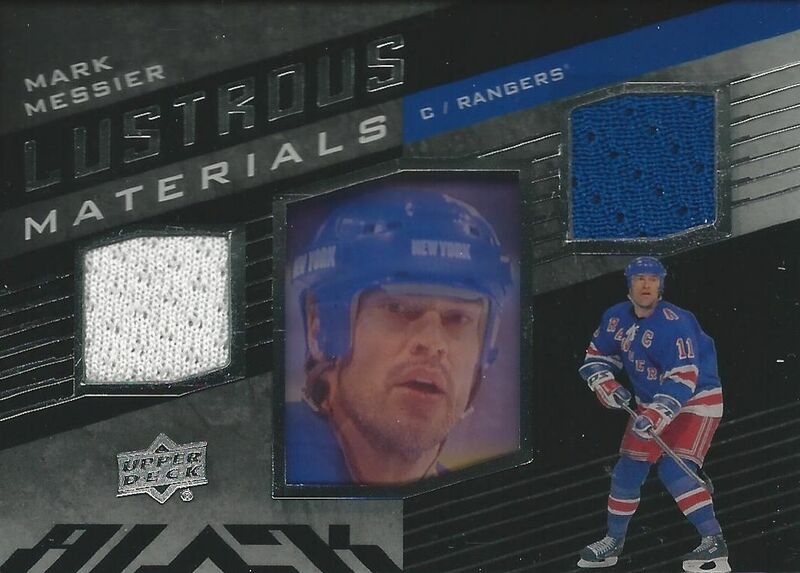 I just wished this Messier I pulled had some ink on it! A lot of popular Ice hits are back for collectors to find when they purchase their boxes of Ice this year. One of the best to find are the Ice Premier Patch cards numbered to just 10. Those always look great and are a huge hit for collectors. I found Ice to be a really great product this year. It was a bit surprising to find out that there were only 8 packs in each box. There used to be around 20 if my memory serves me correctly. Ice has come back to hockey cards with an extremely strong release - it's better than it ever was. I would definitely recommend getting a box or two of Ice. So far I have found it to be the most exciting product that has come out all year. Great base cards? Check. Awesome hits? Check. Check this off your list and get yourself some! Hey it's me crazyshnitzel thanks for the win in the opc contest! This product looks absolutely amazing. Hope to buy a box. I love the look of Ice this year. Acetates are sick. Spot on with the Base Card And Hits review, love the look on these cards. Love the look of the messier! And nice fleury! Great review, glad that Ice is back!!! Love the look of the base and the hits you got were awesome!!!!! Nice Habs quad-jersey! The Messier jersey looks great as well. I'm a big fan of the acetate base card design. Nice break! Nice product ! Definitively gonna buy one box !! + Great looking base cards, with a special feeling to them thanks to the acetate. 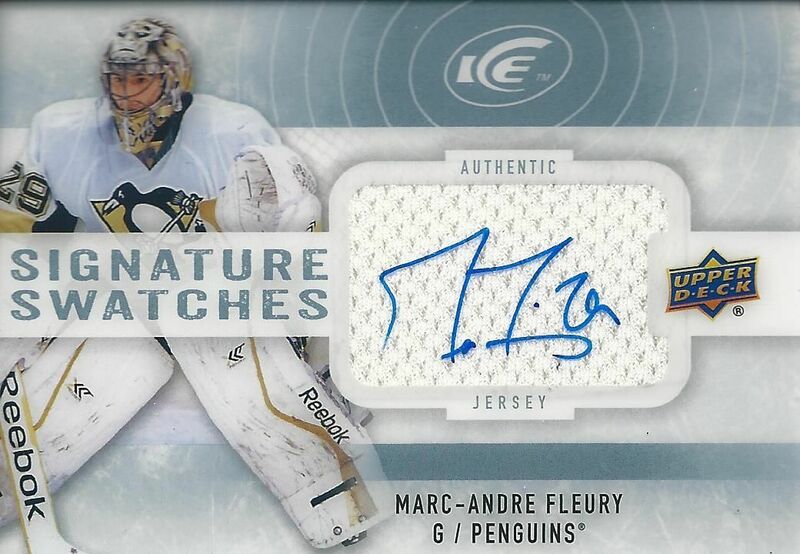 + Inserts like the Signature Swatches card and UD Black cards do look great. - The frozen foursome card feels weird, since it's vertical. - It's hard to see the autographs on some of the acetate cards. ps: the base colours are BLUE 42 cards, for current players RED, 30 cards (1:3), for goalies and YELLOW 12 cards (1:7), for legends, they are short prints, not parallels though. Nicely done in your break Luke! The all acetate base set looks great and the available hits have a nice design to them. Bring back UD Black into a product is great to see. Great review! I like how descriptive and opinionated you were about this break! I love Ice. I was so disappointed when they discontinued it it and I love that they brought it back with 8 pack configuration. The base cards look awesome and I find every insert and hit set looks really awesome. I also like that the highest rookie parallel is /999 instead of the previous /1999. As for your box, all of your hits were pretty good, nice to get an auto jersey card rather than a regular auto hit. Thanks for the review and video. The quad jersey sure looks boring but the rest of the hits look nice. The base cards also are ok.
Great Review ! Love this product and its clean look. I really enjoy the style of the autograph cards in this product. Love this review!!! I have tried some packs and now I learned some more about this product!! I love your breaks and I rate this10/10 because of a great description!!! I am looking toward to more of your breaks!!! Hey blacksheep can u plz enter me in this give away i never see my name! Love the Rookie cards and auto you pulled. The 4 some jersey cards should all be numbered. I always liked the ICE set. Clean cards. I really like the Messier one.